Today's lecture will focus on some tools that you can use to explore your dataset a little more closely. Along the way, we will teach you two important concepts that we use heavily in data analysis. First we will go over some syntax that will help you construct some special arrays very quickly. Then we will introduce the find function in Matlab that helps you search for values in your data. For the remaining class time, you will be able to use these tools to create several different kinds of plots in Matlab. 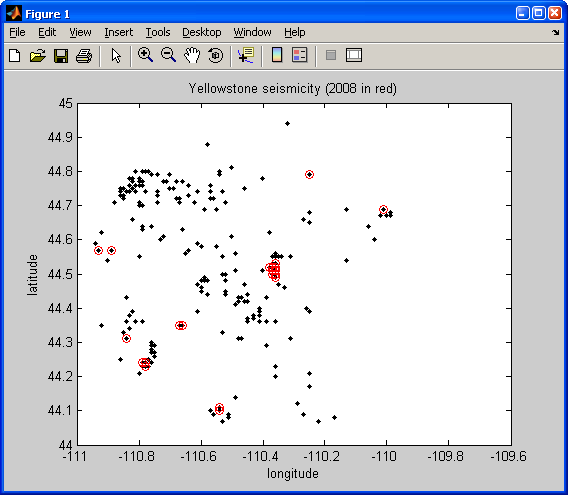 For the examples in this demo, we will refer to Yellowstone seismicity. At the end of 2008, Yellowstone National Park experienced an increase in seismic activity in the Yellowstone Lake area. We will take a look at this swarm of earthquakes, as well as others that have been recorded since 1973. You can find out more about this swarm here. You will need to download the text file that includes the earthquake data from here. To make arrays with n rows and m columns, the syntax would be ones(n,m) and zeros(n,m). In the above example, tf is a new matrix filled with 1's and 0's. There is a 1 where the conditional of A > 5 was true, and 0 where it was false. Look at the MATLAB documentation for find. Basically it returns the array locations where values are == 1. In combination with the conditional or boolean statement like the tf examples above, it is very powerful for processing data. figure is a command used to initialize a new figure window. If you just type it in, it will display and empty figure window. Typing figure(1) makes the window "Figure 1" the current figure window. Yes, you can have multiple figure windows open at the same time. Typing figure(2) would make the window "Figure 2" current, and so on. So any plotting commands used subsequently will be displayed in the current figure window. clf will clear the current figure window of all plots that are in it. the second plot command would "blow away" the first earthquakes that we plotted. So hold on, tells Matlab to "hold on! We've got some more stuff to plot here!" To then release the figure, so that the next plot command will replace the figure, we can type hold off. BE SURE TO USE THE MATLAB HELP TO FIND PROPER SYNTAX AND USAGE FOR FUNCTIONS! These are not the only choices, so we encourage you to try things on your own.